Firmly ensconced in the suburban sprawl of Concord, NC lay a railroad past bypassed with explosive growth in the Charlotte metropolitan region. As time has marched onward, the expansion of Concord has cloaked a past not unlike numerous cities and towns throughout the North Carolina Piedmont. Whereas the dependence on the railroad---whether it be for passenger travel or the corridor for a bygone textile industry, the stamp of the past remains conspicuous along this former Southern Railway main line. Modern day annals, however, tend to overlook Concord as compared to other locations along the route such as Salisbury, Spencer, and Kannapolis as examples. 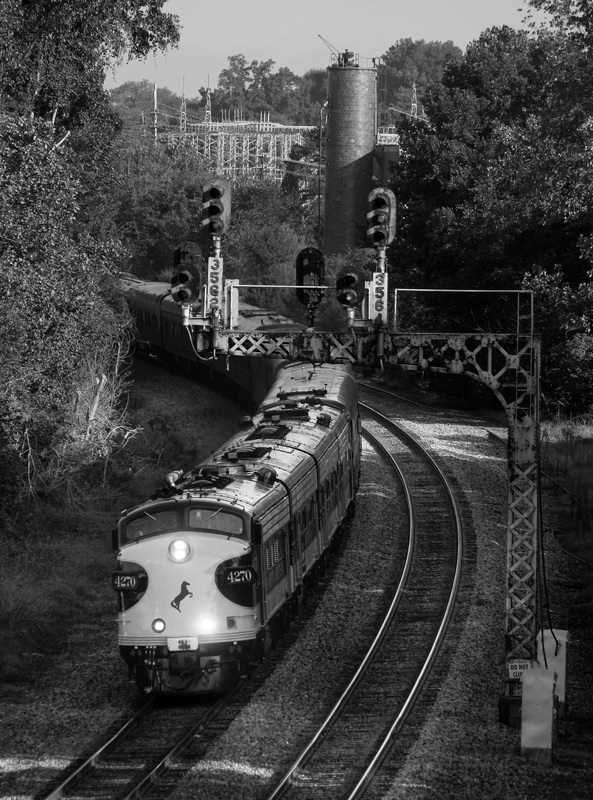 Archival images of the railroad in Concord are fewer which is a continued trend as modern day photographers tend to frequent other locations instead. ​The railroad origins of Concord date to the antebellum period a decade before the onset of the Civil War. 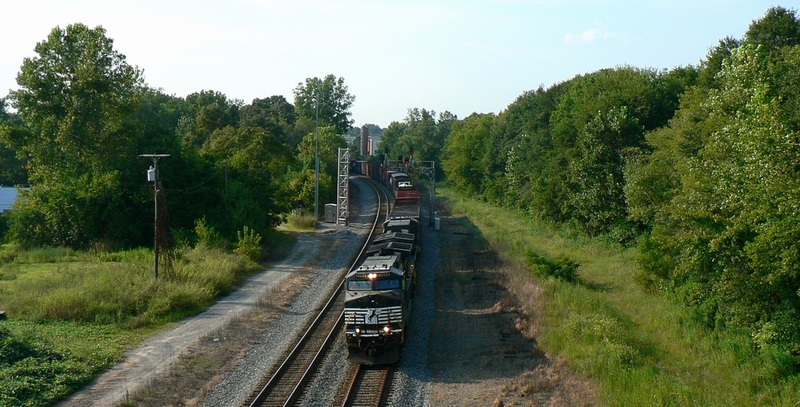 In 1848, the North Carolina Legislature passed a bill for the construction of a railroad connecting the coastal region of the state with the interior Piedmont. 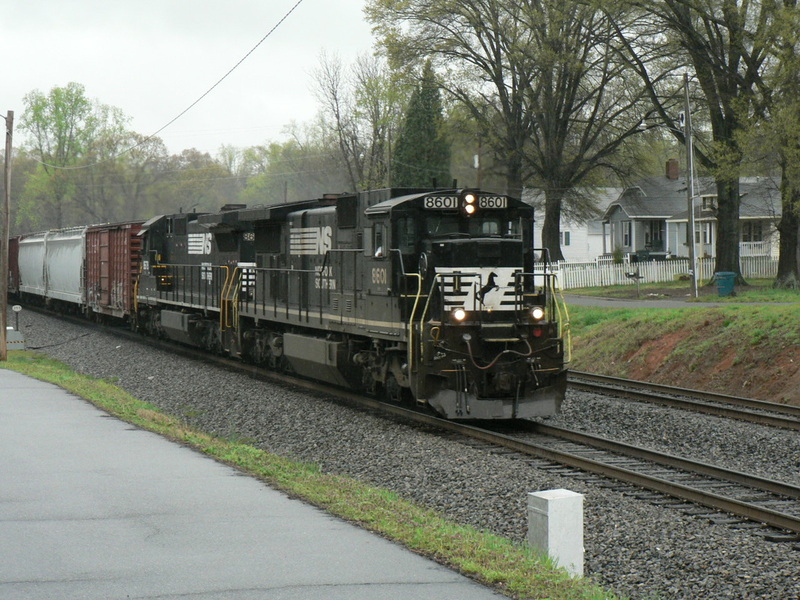 The following year, the North Carolina Railroad was chartered with the intent of constructing a 223 mile corridor between Goldsboro and Charlotte. 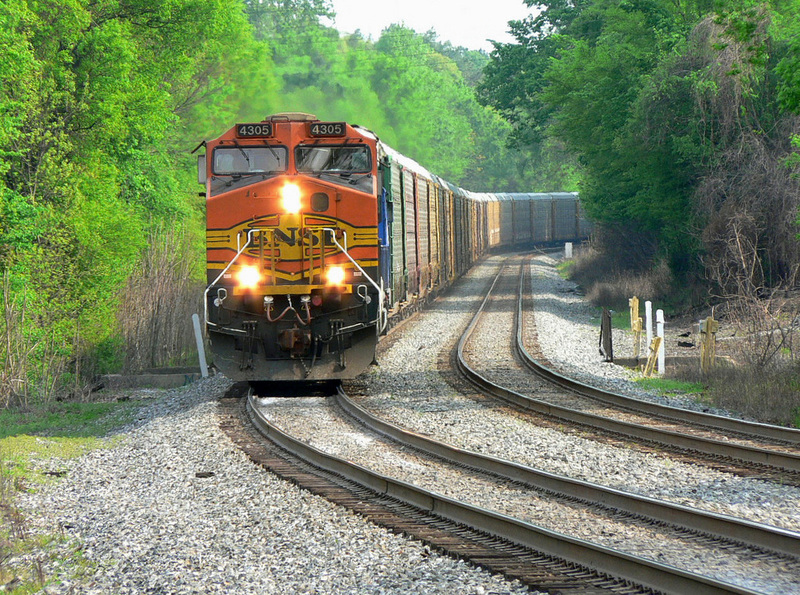 On July 11, 1852, a groundbreaking ceremony was held in Greensboro and construction of the railroad began in earnest. Four years later, towns along the route---including Concord----witnessed the passage of the first train to traverse the length of the railroad in January 1856. ​After the tumultuous Civil War years, the Richmond & Danville Railroad signed an operational lease with the NCRR in 1871. This lease remained in through the R&D RR years until the railroad was acquired by the Southern Railway in 1894. Maps of Concord during this era are in existence and indicate the exact location of the first depot there. Conversely, there appears to be no photographs or artist renditions in the public domain revealing the early appearance of this structure. This 1921 Sanborn Fire Insurance map focuses on the central area of this treatise. Depicted in this map are the Concord station, Cabarrus Cotton Mill, and the Southern Railway freight station as each was laid out. ​During the early 1890s, the Concord Railroad Company constructed a line from the depot area into the downtown district two serve the local businesses. Due to the topographical layout of Concord, the physical town was located above the railroad right of way and the public sought a better method of freight and passenger transport other than horse pulled wagons. 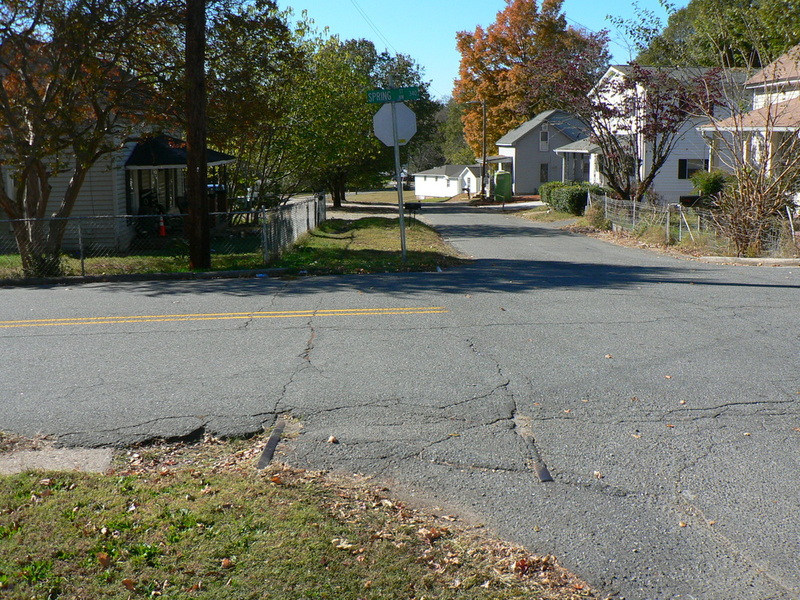 Designed as a “steam” line and dubbed the “Dummy Line”, this street track diverged from the Richmond and Danville main line and ran on Corbin Avenue until reaching the business district at Union Street. Here, it turned west and split numerous times with spurs to serve the local proprietors. Within a few years, it was extended further north on Union Street and to the Gibson Mills plant at present day McGill Avenue. In spite of these efforts, the “Dummy Line” was plagued with problems most notably pertaining to reliability issues. 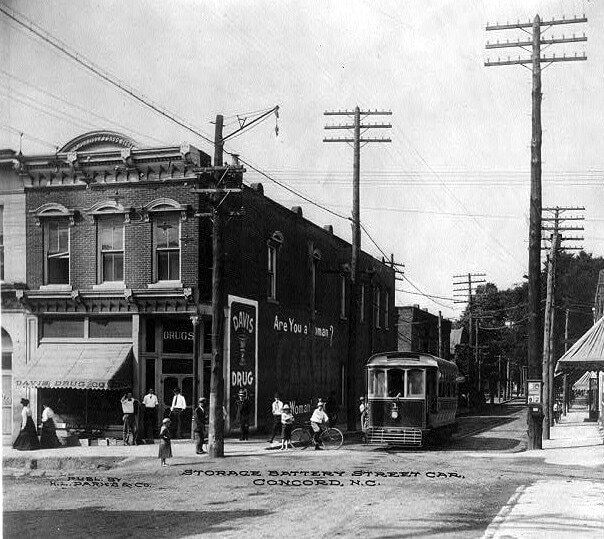 Concord was among the first urban areas in the United States to utilize battery powered street cars and their usage on this route was generally unsuccessful. The battery life was short and passengers frequently assisted by pushing these cars. By the end of the century, the “Dummy Line” was history and Concord constructed a true streetcar system of which partially utilized this former route. An 1892 Sanborn map highlighting old downtown Concord which reveals the route of the “Dummy Line”. Route connected the Southern Railway freight station with the business district on Union Street. Not only was the "Dummy Line" important for passenger travel from the railroad station to inner Concord, but vital to the transfer of freight as well. This scene freezes in a time an early shipping point along the route, the Cotton Platform. 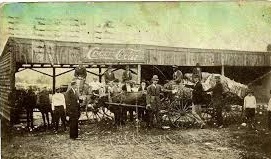 Local merchants brought their wares here to load for furtherance by rail. Note the earliest Coca Cola logo above the platform. Image Concord Public Library. 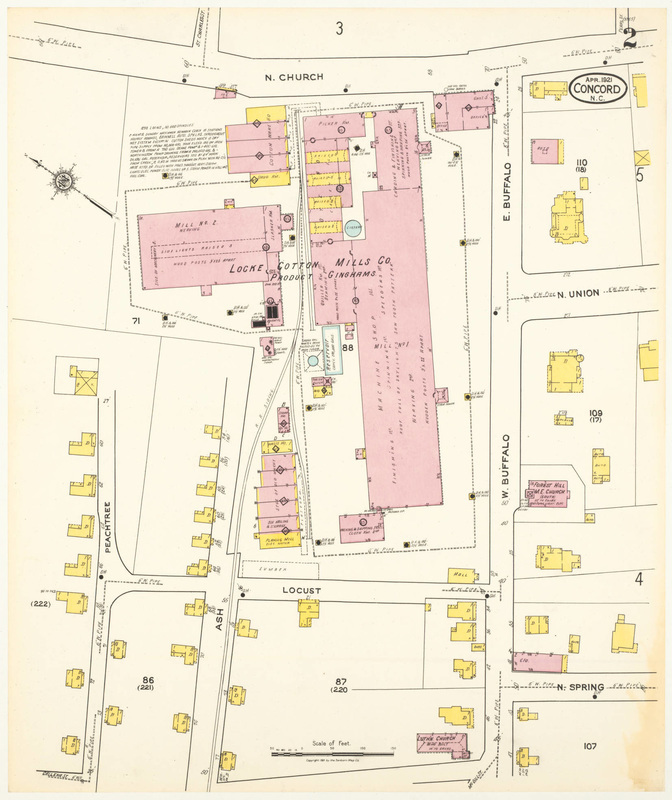 ​By 1892, a Sanborn Fire Insurance map indicates that a small wooden passenger station existed on the west side of the now Southern Railway main line opposite the freight depot and cotton platform on the east side. A separate smaller structure was located adjacent to it. Perhaps this was also the location for the original station as well—structurally repaired as needed but oddly located opposite the town district side of the railroad. 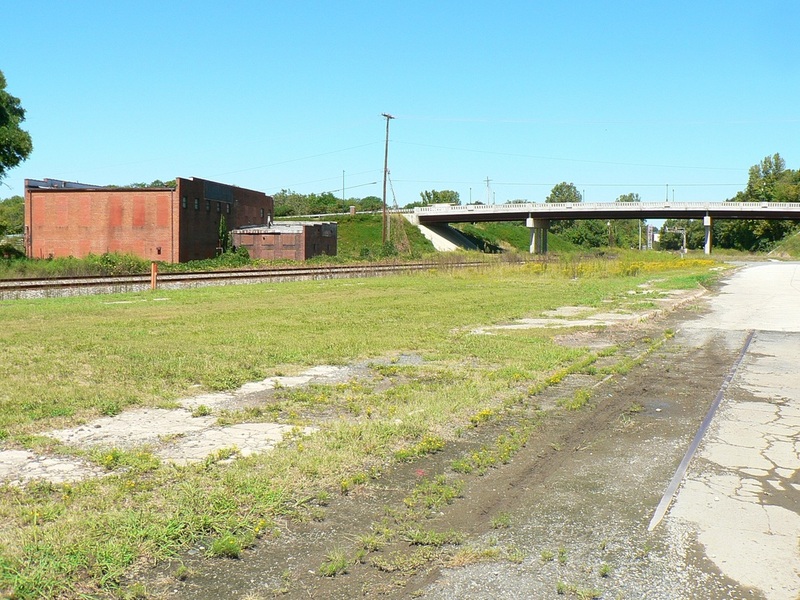 It was also during this era that the Cabarrus Cotton Mills was constructed opposite the station located on the same side of the tracks as the freight depot. ​At the turn of the century, a new passenger station was constructed on the east side of the railroad by the Corbin Avenue grade crossing south of the freight depot. This structure was also of wood construction and included a separate baggage office. The life span of this station was through the first decade of the 1900s remaining until 1913. 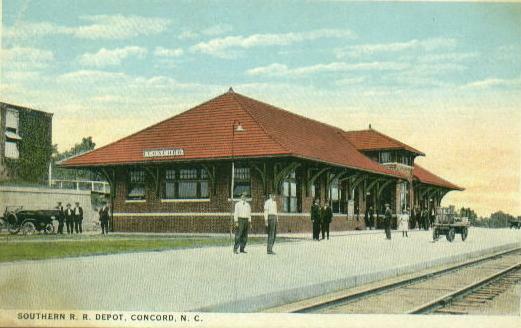 It was that year that a newer relocated passenger station would be constructed serving Concord until the 1970s. Construction began on a larger station several hundred feet south of the existing depot. 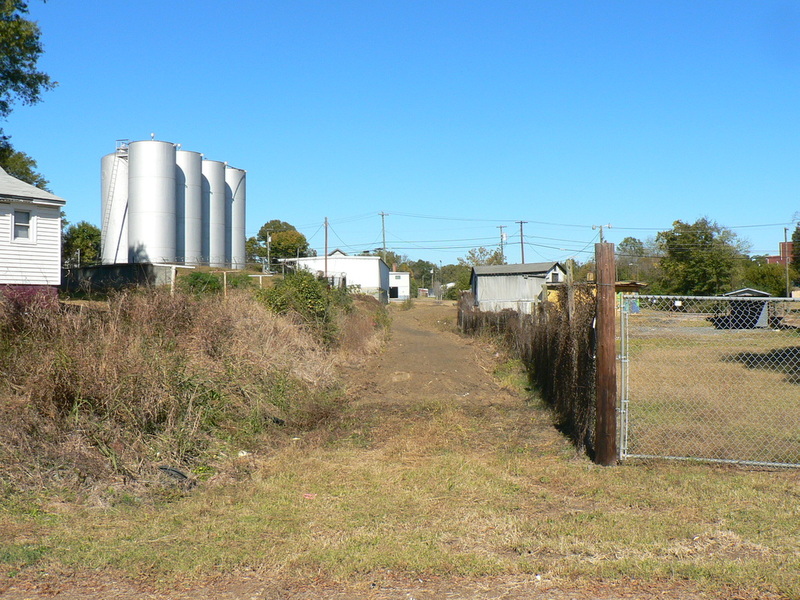 The location, in effect, sandwiched the new site between the Southern Railway main line and the Cabarrus Cotton Mills. This new station built with brick and trimmed in wood was resplendent in the Victorian influence of the era. Solid and attractively designed, it became the railroad centerpiece for Concord during the halcyon years until the end of passenger service. The World War II years—as with other uncounted stations throughout the nation—proved as a bright but brief zenith of the passenger train in full glory. As an example, in 1941, fourteen trains still called at Concord. Name trains such as the Piedmont Limited #33 and #34, the Peach Queen #29 and #30, and regionals such as #11 and #12, the Danville, VA-Greenville, SC, all stopped at Concord during this era. In March 1974, a northbound Southern Railway manifest derailed in proximity to the passenger station. As evidenced in this image, cars were scattered and the structure received damage to its front. Image William Teal/Independent Tribune. In the postwar years as passengers left the rails in mass exodus, trains were either combined or abolished. Examples affecting the patronage at Concord included combining service from two trains into the flagship Crescent. 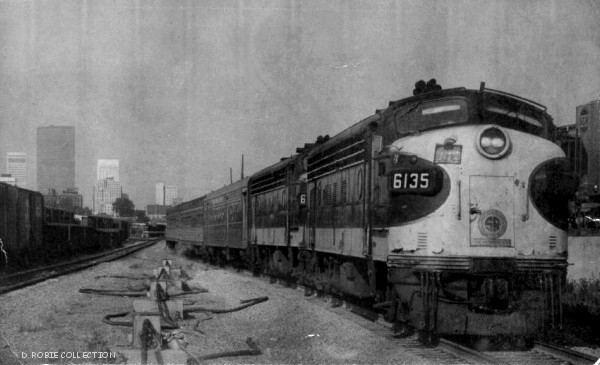 The southbound Aiken-Augusta Special was absorbed into the Crescent in 1956 and the northbound Peach Queen several years later in 1964. Further cutbacks would ensue as the passenger base eroded and services discontinued. In 1971, what remained of the national passenger network was forged into Amtrak but the Southern Railway remained a stalwart by continuing to provide its own service that would continue through the 1970s. 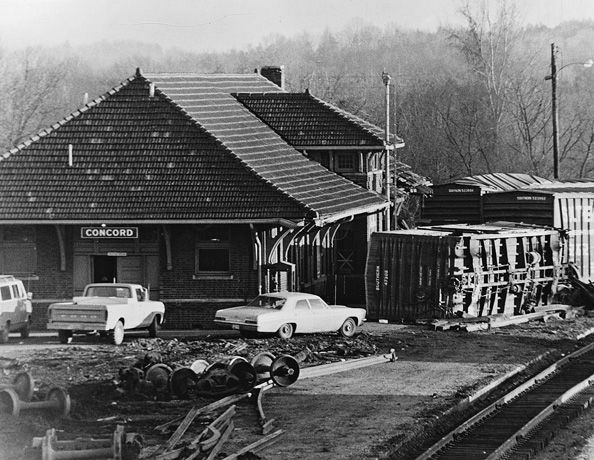 In March of 1974, northbound manifest train 158 was passing through Concord when a defective wheel on a freight car picked a switch causing a derailment. This resulted in a pile up at the station area and the building sustained damage to its south and west sides. The damage was repaired but by this date, the venerable old structure was nearing the end of its useful life. In 1976, came the coup de grace. Trains #1, the southbound Southern Crescent, and #5 and #6, the Piedmont, remained on the timetable but by the end of the year, the Piedmont was abolished. With the discontinuance of the Piedmont, Concord was eliminated as a passenger stop. The Southern Crescent existed for another three years until the Southern Railway succumbed its passenger operations to Amtrak. On March 28, 1978, an epoch ended. The noble Concord passenger station, standing in silent vigil to a bygone era, met its end. 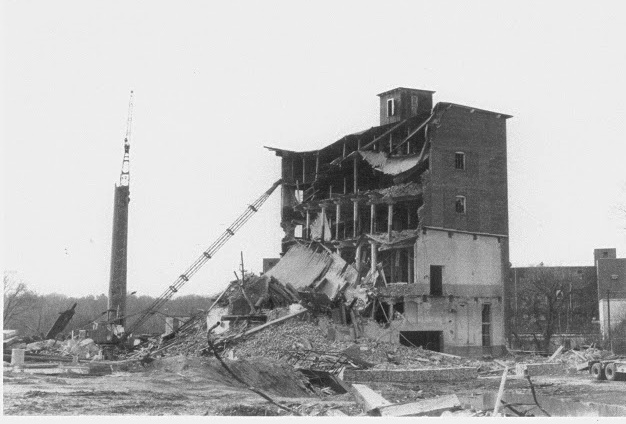 Demolition began on this date to raze the structure and as the bricks crumbled, the visible connection to passenger rail at Concord belonged to history. In a sense, ironic, as a regional passenger rail renaissance occurred the following decade. In 1984, a joint effort by the North Carolina Department of Transportation (NCDOT) and Amtrak resurrected the Piedmont train although it lasted but a year due to agreement conflicts. After a five year hiatus, service was resumed in 1990 and subsequently expanded in the 21st century. Today, eight passenger trains--the Crescent Limited and six Piedmonts--- pass through Concord by an empty lot where its station once stood. 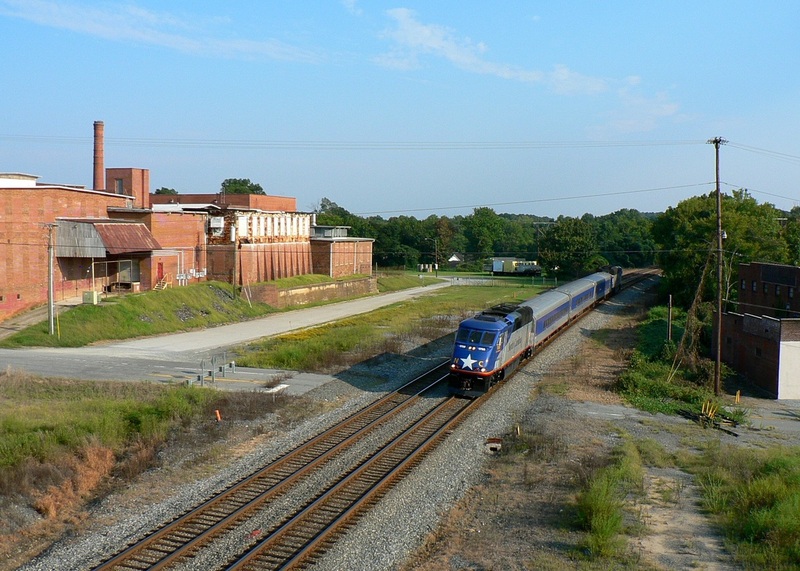 With no structure to serve as a terminal, Concord is now but a milepost location along the main line nestled between the stops at Kannapolis and Charlotte. Whether a new station is constructed to reinstitute Concord as a terminal may be a topic of future city and NCDOT discussion. At the heart of the rail operations in Concord from the late 1800s lasting until the mid-20th century was the Southern Railway freight depot. The earliest map records indicate this structure in 1887 integrated with a cotton platform. As industry expanded by the turn of the century, a new, independent freight station was built on the north side of Corban Avenue and was serving the increasing needs by the year 1902. At this date, a single track ran alongside the structure. Within four years, the Southern Railway had expanded its plant with the addition of an auxiliary track on the west side of the mainline adjacent to the depot. By the time that old Concord was in full bloom during 1921, the Southern Railway had added a second auxiliary track adjacent to the mainline as well as the addition of a second track at the freight depot. Increased business facilitated these additions with the area mills generating carloads of traffic. With the passing of years, the freight depot diminished in relevance and especially after the World War II years. This was basically a reflection of the national trend as trucks had taken a considerable amount of the less than carload business for customers that were not directly served by rail. By the 1960s, the freight station was seldom used except as storage but the tracks adjacent to or that once served it used for staging of freight cars. An aerial photographic record indicates the Concord freight depot was still extant in 1965 but a photo used on this page taken by the end of the decade reveals its absence. 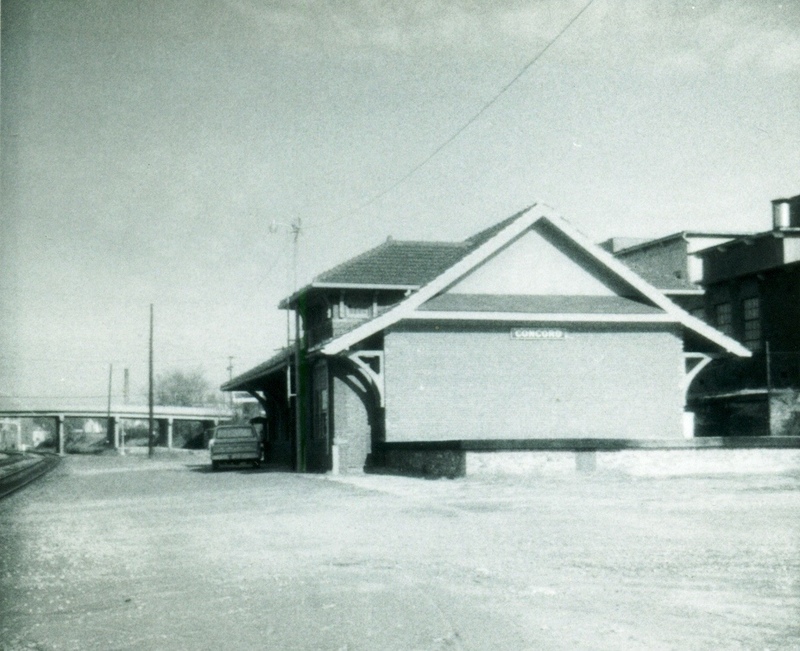 Unless the date on the image above showing the south end of the passenger depot is incorrect, the depot was demolished during the late 1960s. The freight depot would clearly be visible in this image had it still been standing. During its industrial heyday, Concord shippers kept a local switcher busy. 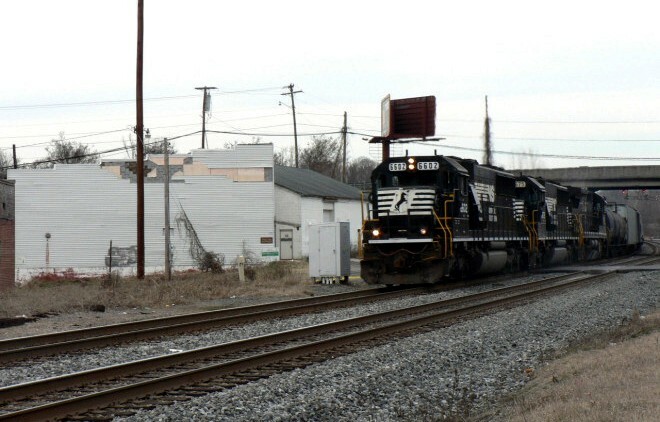 The mills generated a constant flow of traffic to and from to be worked as well as the transfer of this freight to and from yards located at Charlotte and Spencer. This predominately consisted of boxcars loaded with raw and finished goods as well as hoppers loaded with coal for power and heat. The operational practices changed over the course of the years--once the area began to decline and shippers gradually disappeared, longer distance locals became more of a factor switching industry in a larger region. In regards to the actual switching, the Locke Mill spur required a strategic plan for the crews that worked it. There is no indication that a runaround track existed along this spur--although one may have been---and a train working this spur required planning to effectively switch it given the number of shippers and the orientation of the individual spurs. During the course of textile mill historical research for this article as well as others, your author has discovered that it is quite an undertaking. First and foremost, it is unfathomable as to the wide spread extent this industry and the economic position in society it once occupied. It literally defined uncounted communities small and large alike as the heart pumping the life blood simultaneously of that of commerce and employment. For more than a century, it regulated healthy stability throughout the body that was the community. When the domestic textile industry was obliterated on the eve of the 21st century that heart was affected accordingly. Many textile towns died, others remain on life support, and a fortunate few have discovered a cure only through the ability to diversify in a changed economy. And in the context of the railroad from the loss, it was proportionately injured by the lost revenue and traffic related to the industry. As the textile industry was laid to rest, the railroad---if not a pall bearer---was surely standing graveside with its head bowed in sorrow. Historical data and images vary as to availability. As an example, two of the mills that existed in Concord--Locke and Coleman-Franklin--are recorded thoroughly in the annals simply because of their respective historical significance. In fact, so detailed are these two industries that a considerable amount of that information extends beyond the scope of this piece. Images follow suit--specific structures were simply photographed more than others to at least the extent at which it can be found in the public domain. Conversely, the majority of structures are more obscure--detailed information about them is sparse or it escaped the hand that held the pen through the passage of time. Accordingly, any additional information that is uncovered about the structures that fall into this category will be updated on this page. ​Concord, like numerous communities throughout the North Carolina Piedmont region, is an industrial heritage intertwined with that of the textile industry. For more than a century, it served as a commercial base of manufacturing while employing hundreds, if not thousands, spanning the generations. Unlike other former centers of textiles, however, Concord flourished—as a contrast--- despite the collapse of the industry by embracing urban expansion and the diversification of business. 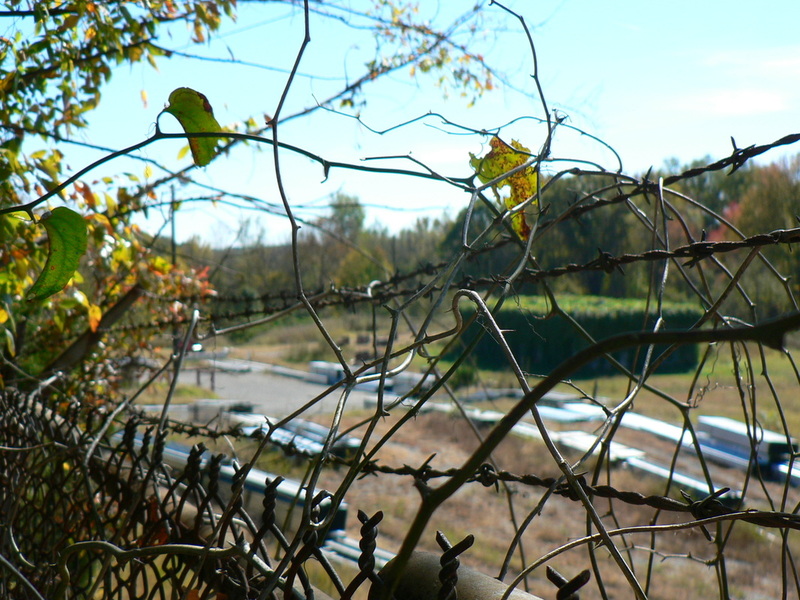 But as this transformation has occurred, the remnants of the textile industry are still to be found in the old section of town adjacent to the railroad. 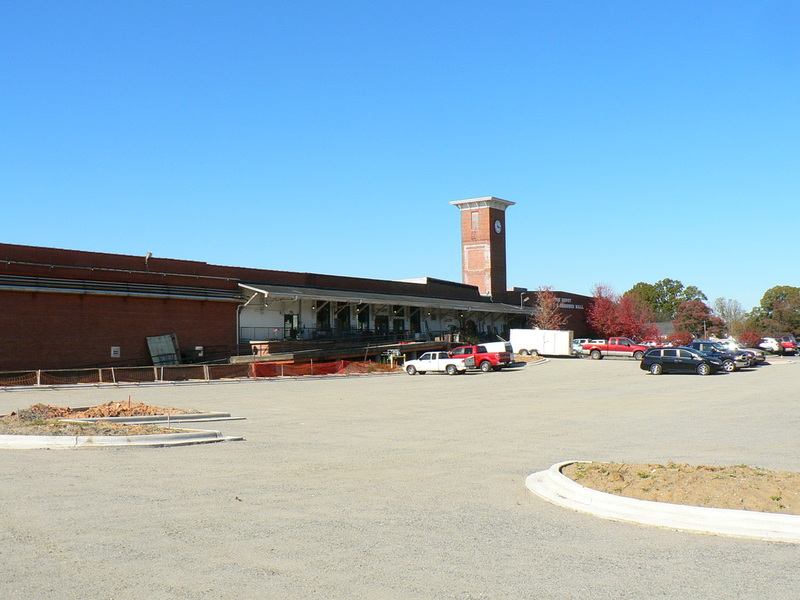 As a transition from Concord passenger station history, the industrial heritage will commence in proximity with the old Cabarrus Cotton Mills. 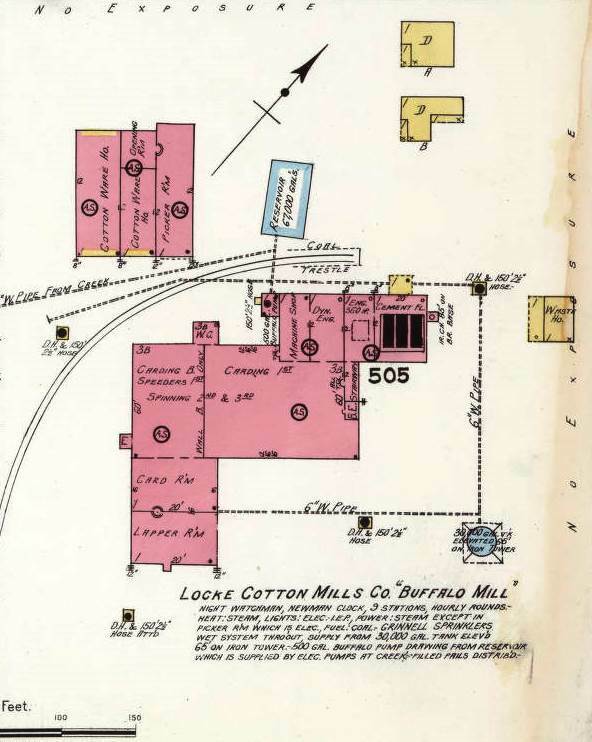 In 1892, the Cabarrus Cotton Mills was built alongside the railroad at its center in Concord adjacent to Corban Avenue. It was in a prominent location at the focal point of both the railroad freight and passenger stations at the forefront of visibility. The mill expanded in size and capacity in the early 1900s which also included the addition of a second spur to accommodate increased traffic. 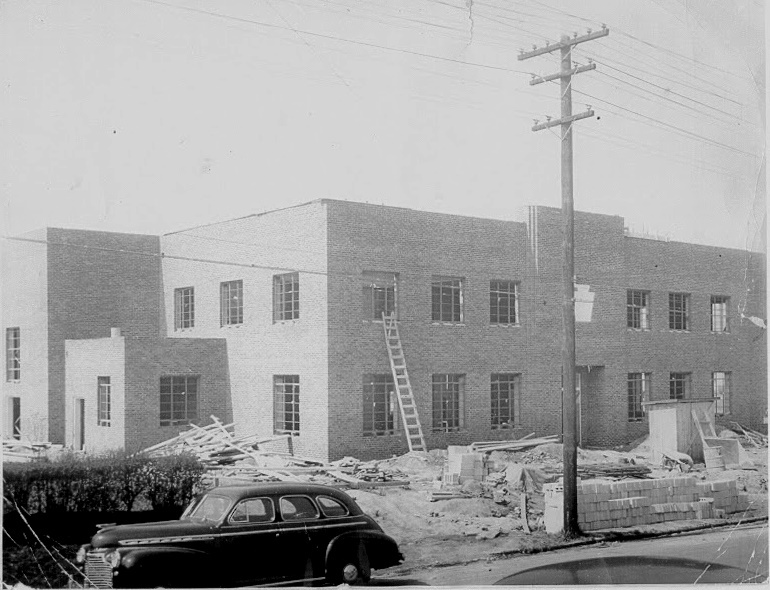 It was an independent operation until 1928 when it was folded into the Cannon Mills empire becoming Plant #5. For the next half century, the plant continued to operate as one of the cogs in a regional textile environment until detrimental trade agreements and cheap imports doomed the industry. The building stands today as a sentinel to another time now occupied for use by the City of Concord. Due to its location where the railroad passenger station once stood---by default---images of the structure as well as the 1921 Sanborn map which features it are outlined in the station section above. Two mills were positioned along the railroad to the north of the town center region near the station. The first of these, Buffalo Mills, constructed in 1895, existing independently until its acquisition by Locke Mills in 1909. Operating as a separate extension of the Locke Mills, it continued to be known as simply the Buffalo Mills. By the 1950s, it changed affiliation to the Kerr Bleaching and Finishing Works and remained under that banner until it ceased operations in 1979. It has since been among a number of Concord mills that met the wrecking ball. It was served by a single spur that diverged directly from the Southern Railway mainline. 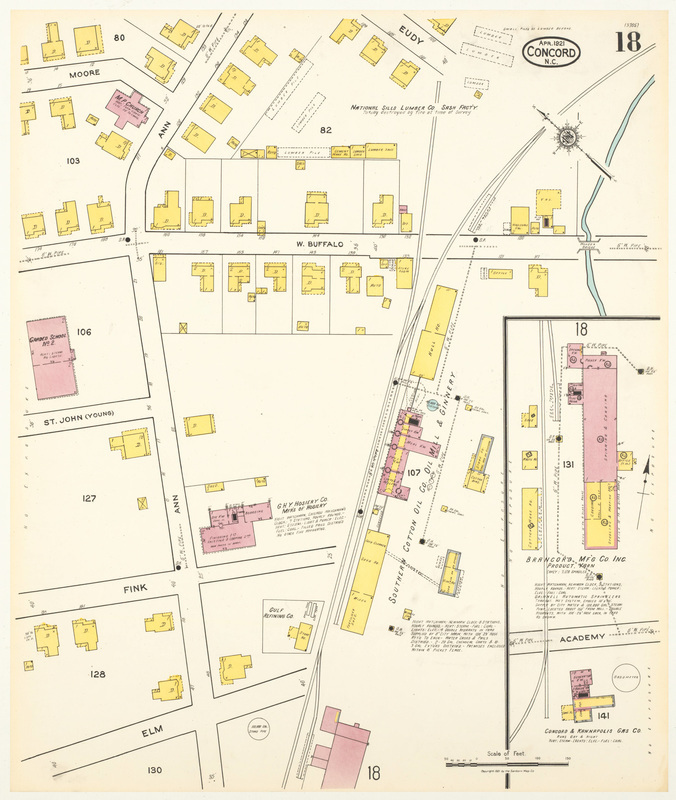 At left: Buffalo Mills as it was in 1921 as outlined on a Sanborn map. It was the smallest of the group of mills served by the railroad. At the northern extremity of the original city limits, the Gibson Mills was built facing McGill Avenue in 1899. In its original configuration, this was a multi-story structure as evidenced from early 20th century postcards. Historical documentation of this mill is sparse but during its active life, the architecture was modified resulting in a mostly single story plant. 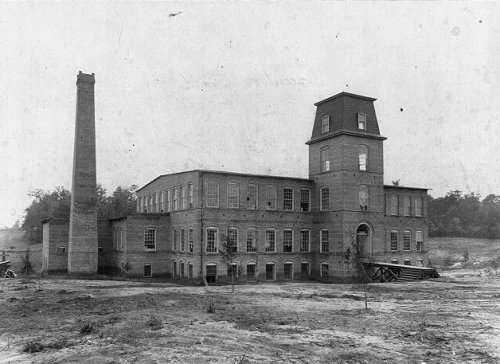 Gibson Mills was among a number of Concord mills owned by the Cannon family that were forged into the Cannon Mills conglomeration becoming Plant #6. It is curious to note that the orientation of the mill to the railroad also changed. Early images depict the structure nearly adjacent to the mainline but in its later configuration, it is further removed. Service by rail was by a siding from the mainline that crossed McGill Avenue extending to the rear (west side) of the structure. As with the other Cannon Mills plants that survived through acquisitions concluding with Pillowtex, its production fell silent with the corporate 2003 demise. The Gibson Mills building survives today by renewed use an antique mall and mini brewery. Gibson Mills was the northernmost Concord mill located along the railroad. Situated at McGill Avenue, it was at the edge of the city limit during the era of this 1921 Sanborn map. Absorbed into the Cannon group of mills, it became Plant #6. South of the railroad epicenter of Concord were located two other mills served directly by spurs from the mainline. The first of these, Young-Hartsell Mills, was built on the west side of the railroad and approximately a mile from the depot region. Construction year is listed as 1905 and it remained under this ownership until 1939. The Hartsell Mills, as it was commonly called, was one of the few mills in the vicinity that did not fall under the Cannon family umbrella; rather, it was purchased by and renamed the Stead-Miller Company in 1939. This mill remained in operation until the demise of the textile industry by the new millennium and the building ultimately demolished in 2012. Hartsell Mills located at the intersection of Charlotte Road (Old Charlotte Road today) and Franklin Avenue. 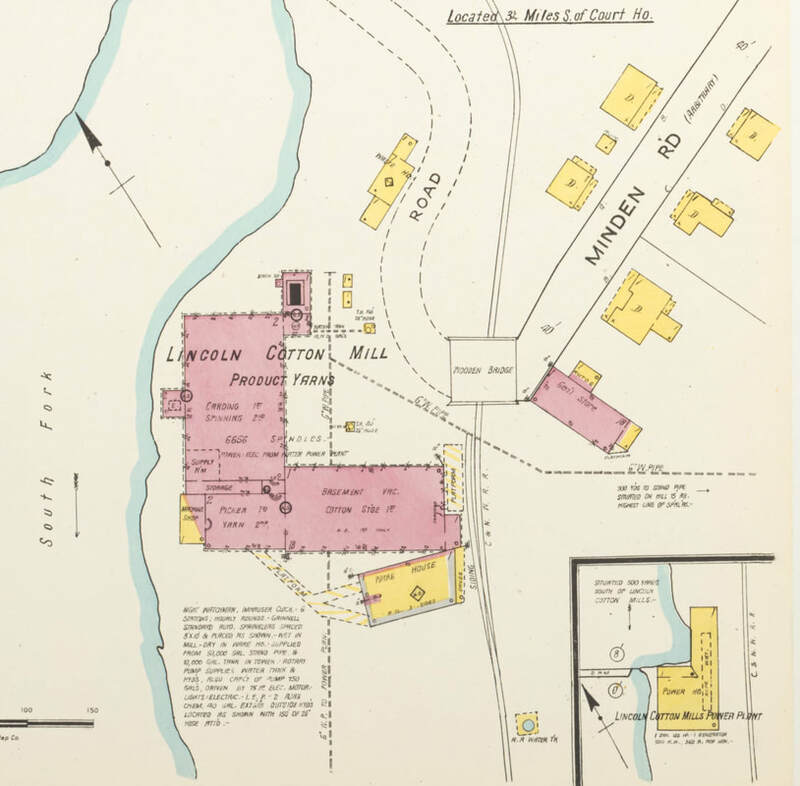 This 1921 Sanborn map includes the mill complex as it was as well as the rail siding. Four years prior to the development of the Young-Hartsell Mills, another had been constructed in the same vicinity of town south and west of the depot. This enterprise, undertaken by W.C. Coleman, is especially noteworthy when placed into the context of the times—it was the first textile mill owned and operated by an African-American in United States history. Coleman built this mill on the premise of creating a workforce of and for the African-American community. He created the Coleman Manufacturing Company in 1897 from capital received from the textile community and individual donors. So unique was this endeavor that it garnered national attention and was noted in business publications of the day. Construction was completed in 1901 but Coleman would not entirely fulfill his dream. Economic hardships---both in the cotton industry and with his operation---limited his business to a mere three years ending in bankruptcy and culminating with his death in 1904. J. W. Cannon purchased the assets and the operation reorganized in 1906 as the Franklin Cotton Mills Company. 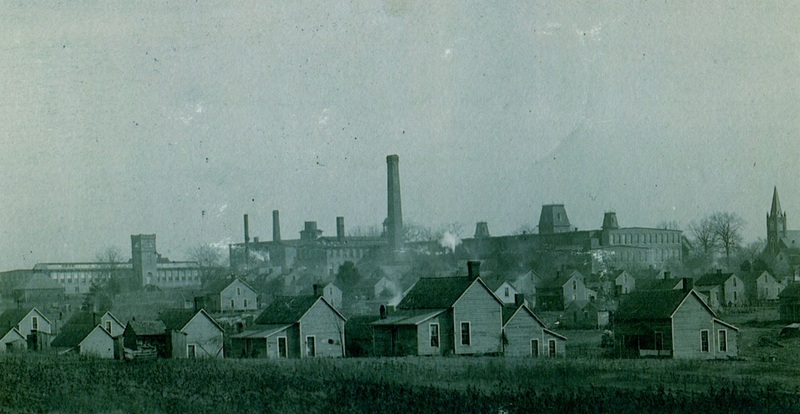 Franklin Cotton Mills as it was in 1921. It was incorporated into the Cannon Mills group as Plant #9. Franklin Mills utilized the former Coleman building for its operation but expanded the facility over the course of time. As with a large group of other mills in Concord, it melded into the combined Cannon Mills conglomeration in 1928 receiving the designation of Plant #9. It continued operating for another seventy-five years until it, like the other former Cannon Mills properties, disappeared in the 2003 Pillowtex bankruptcy. Today, this structure remains intact and houses independent businesses. 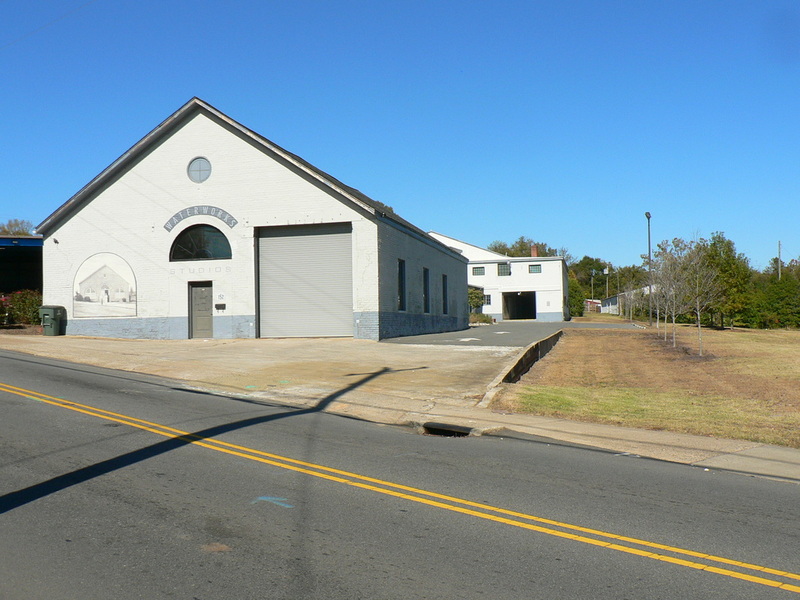 Because of the historical significance of the Coleman Manufacturing Company, the building was nominated for protection on the US Historical Register. A long spur diverged from the mainline that served numerous industries located towards the inner reaches of Concord. These 1921 Sanborn maps highlight and record this area in its prime nearly a century ago. Prominent businesses such as the Cannon Manufacturing Company (later Cannon Mills #2), Kerr Bleaching and Finishing Works, Southern Cotton Oil Company and Ginnery, and the Locke Cotton Mills---most now vanquished from the landscape--are preserved for posterity here. As the industrial development began along the railroad during the late 1800s, a spur was constructed to serve two industries located off the mainline. North of the freight station, track was laid to serve the Cannon Manufacturing Company by 1892. At this date, it was the first and only shipper located alongside it. A decade later, in 1902, industrial expansion facilitated the extension of the spur to the Odell Mills located at Buffalo Avenue and Church Street. Other businesses such as the Southern Cotton Oil and Ginnery and the water works followed suit. Smaller operations also located along the spur and by the 1920s, the extension reached its zenith in terms of shippers. The importance of this spur could not be exaggerated---it was the only means due to topographic challenges for rail to reach and serve the inner reaches of Concord. The spur fulfilled its purpose for more than a half century. The smaller shippers quietly disappeared into obscurity over the course of time but it was during the decade of the 1970s that serious decline onset. A first major blow was the closing of the Randolph Mills and shortly thereafter, the other two large shippers. The shutdown of the Kerr Bleaching and Cannon Mills Plant #2 effectively ended the life of the inner city spur. Today, traces of this once vital corridor remain visible---other sections have been altered or paved over and easily disguise that a railroad track ever existed. The best method to trace the roadbed and right of way of this line is with Google Earth. 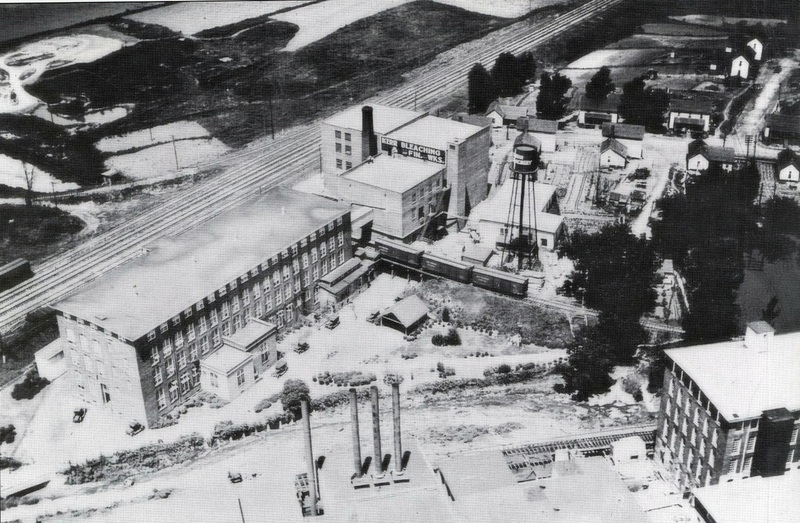 By 1892, two new industrial structures appeared on the Concord landscape, the aforementioned Kerr Bleachery and the Cannon Manufacturing Company. 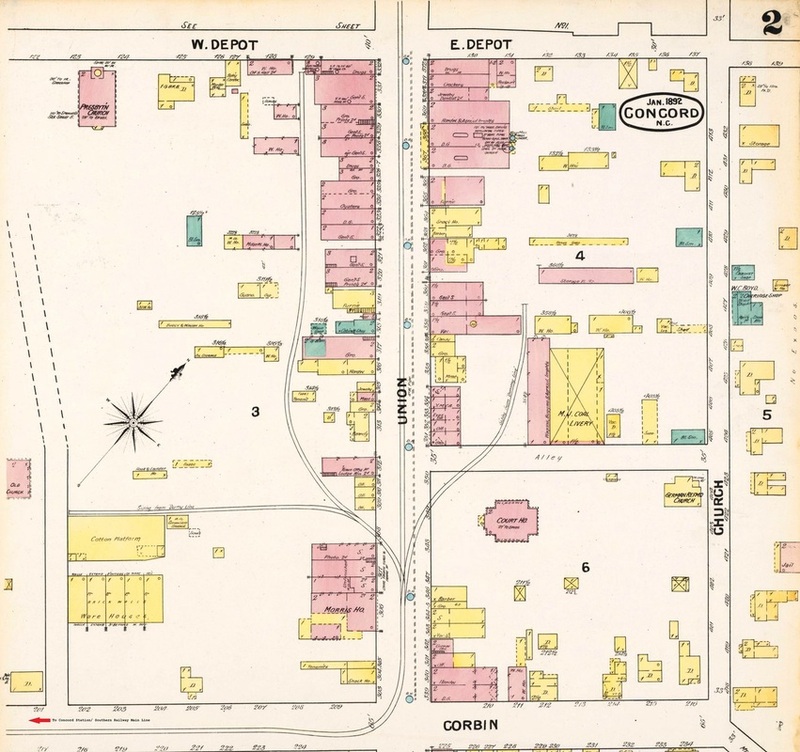 During its infancy the Kerr operation was listed as the Kerr Bag Manufacturing Company although the 1892 Sanborn map identifies the plant structure as a bleachery. It was initially under the ownership of John Odell and along with his namesake Odell Mills, formed an early industrial backbone. Ironically, both of these industries were destroyed by fire and rebuilt in 1909. The 1909 resurrection was eventually renamed the Kerr Bleaching and Finishing Works and retained this name for the remainder of its existence. It was an impressive complex and generated substantial traffic for the railroad. In 1979 as plans were underway to nominate it for protection as a historical structure, it was consumed by fire. 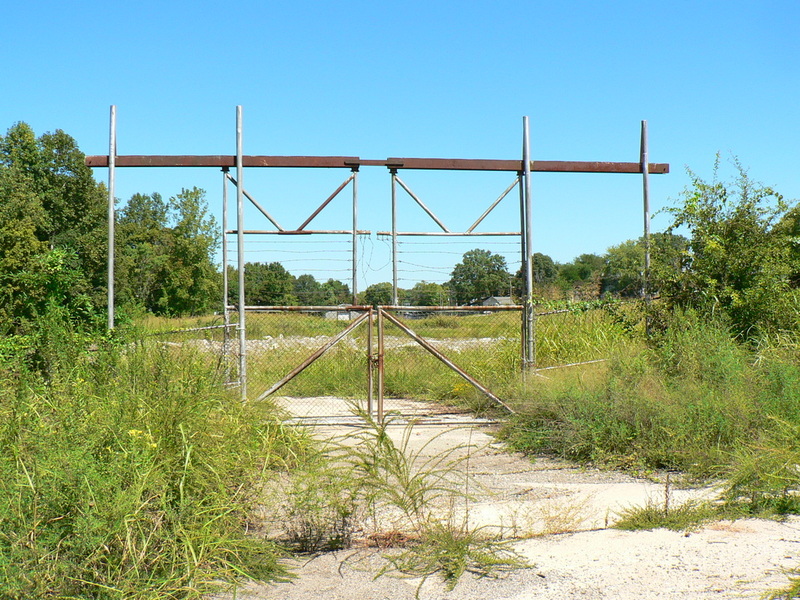 Its remains were demolished and today an open field exists where the plant once stood. At the end of the spur reaching into Concord was the Locke Cotton Mills. 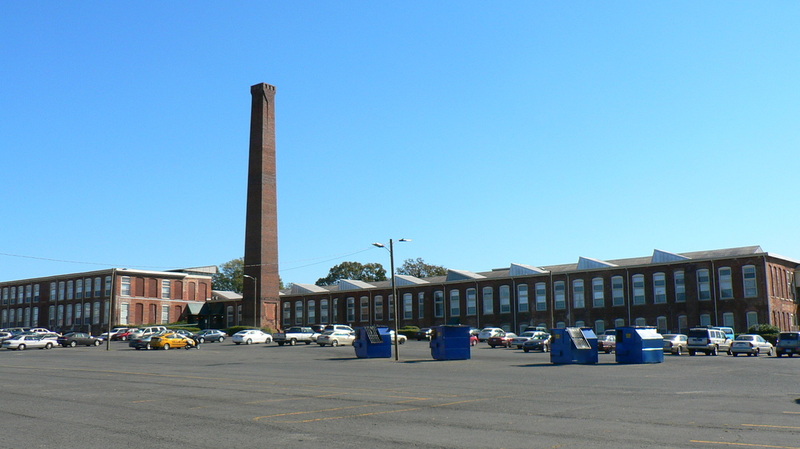 Located well within the interior of the city from the mainline, this was the successor to Odell Mills. It is unquestionably the most documented mill site in the city history. 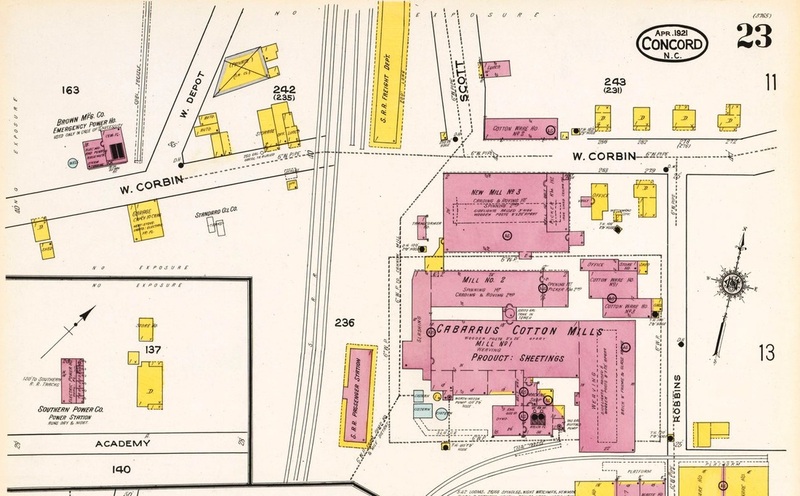 This 1921 Sanborn map offers a glimpse of the layout of the plant in its prime. 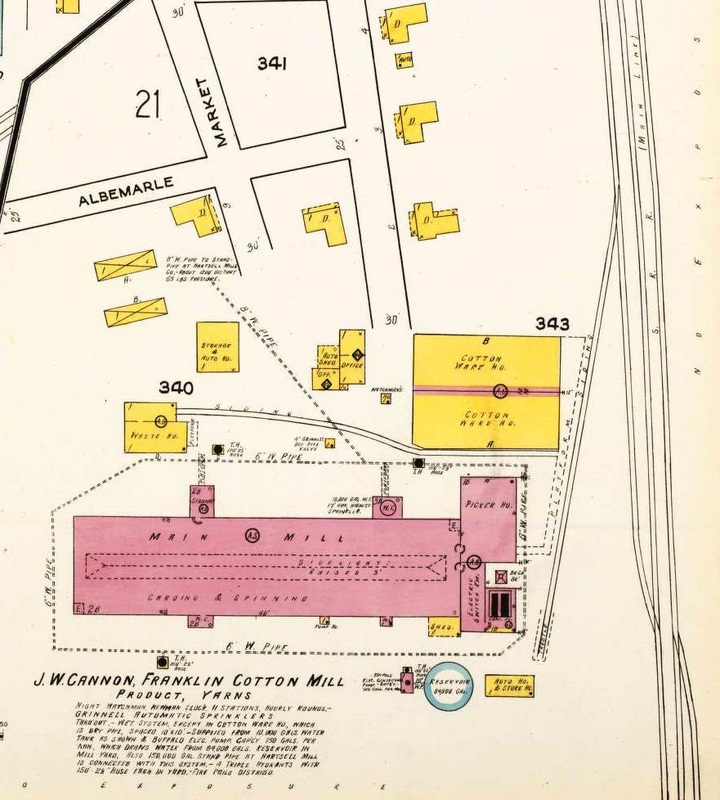 The first---and one of the two foremost--- textile mills in Concord history can trace its beginning back to the antebellum era of 1840 when it operated as the Concord Manufacturing Company (also known as the Concord Steam Cotton Factory or Barringer Mill). It was the economic conditions of the time—low agricultural products and the yearning of other investments aside from land and slaves--- that gave birth to this operation and the spawning of the textile industry in the region as a whole. When the Concord Manufacturing Company opened for business, it began producing goods from cotton, wool, hemp, flax, and iron. Spinning machinery was imported from Pennsylvania and eventually looms were installed. In the years leading up to the Civil War, the company remained profitable in spite of poor equipment and incompetent management. During the turbulence of the war, the Concord Manufacturing Company remained in operation converting its product base to military uniforms. The mill---although threatened during the war---survived the conflict but would face hardships in the near future. Unfortunately, the economic devastation of the war and the ensuing Panic of 1873 spelled its demise under the existing ownership. Odell Mills and the Forest Hills region in its prime circa 1905. This imposing complex as viewed from the residential district dominates the scene giving testament to its size. At this date, it had but three years of existence remaining as it was destroyed by fire in 1908. Image Concord Public Library. After an idle period of four years, businessman John Odell purchased the mill and expanded the property with another building in 1882. Continued prosperity resulted in another expansion in 1889. Odell had further expanded his holdings by this date with the construction of the Kerr Bleachery located south of the Odell Mill. 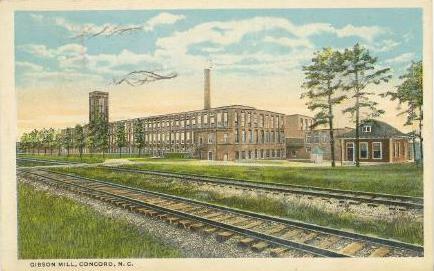 It was during this period that the textile industry expanded rapidly in Concord and as a result, became a regional center with its strategic location along the railroad. 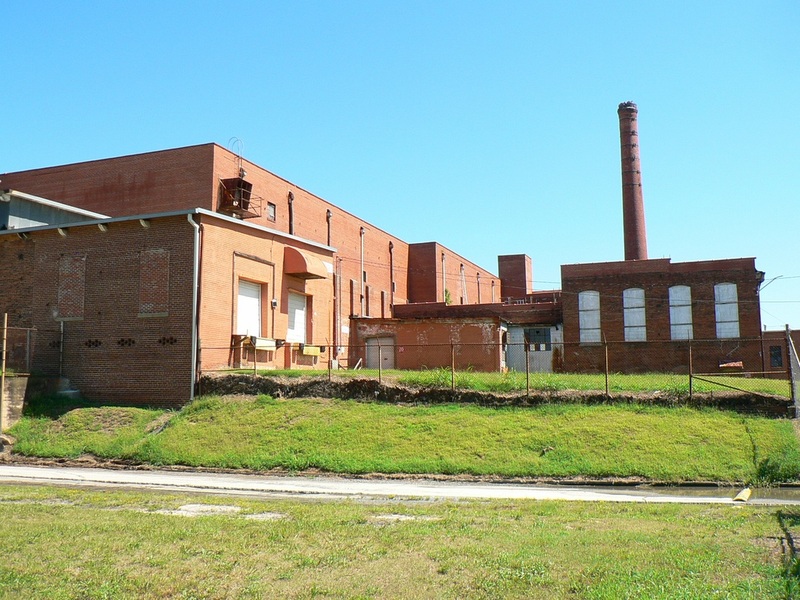 By the turn of the century, the textile industry had become the industrial backbone not only in Concord but throughout the North Carolina Piedmont. In this era of textile ascension, however, John Odell, the man responsible for a significant amount of this growth, would witness his business end in ruin. 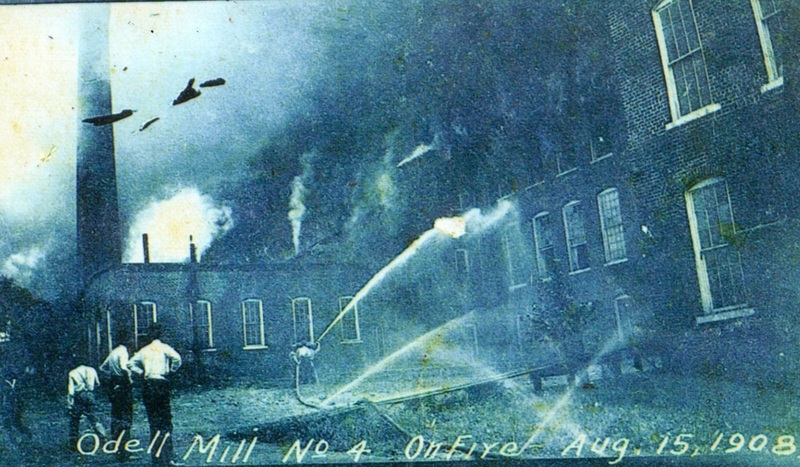 Odell Mills experienced financial difficulty in 1907 and the following year, both it and the Kerr Bleachery were destroyed by fire. Although the Odell era had ended, both businesses were rebuilt in 1909 and would remain in operation deep into the 20th century. 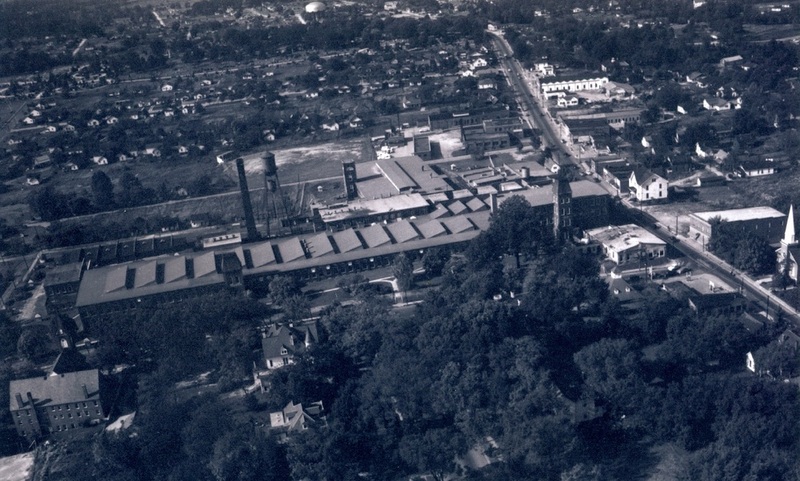 An aerial view of Locke Mills (Randolph Mills at this date) during the early 1940s. Buffalo Avenue parallels the long side of the plant and Church Street at upper right faces its front. The long rail spur into town ended behind the opposite side of the mill from this view. In the distance, Concord has expanded westward. Image Concord Public Library. From the ruins and the sale of the Odell Mills property rose the newly constructed Locke Mill in 1909. This mill was equipped with modern machinery that hence, operated with a smaller work force than the Odell predecessor. For decades, it continued to operate without any further expansion yet surviving through periods of economic fluctuation, most notably, the Great Depression until 1939. At this date, the property was sold and reorganized as the Randolph Mills remaining in business until finally shutting down in 1974. During the life of the operation, minor structural modifications were instituted but the mill remained relatively intact as built in 1909. Today, the Locke Mills complex is registered as a historical landmark and has been converted into apartments and office space. The period of active existence beginning with Odell Mills and continuing through the Locke and Randolph Mills eras generated considerable on line traffic. Before the spur was extended from the Cannon Manufacturing Company, the Odell Mills relied on the Dummy Line for shipping. 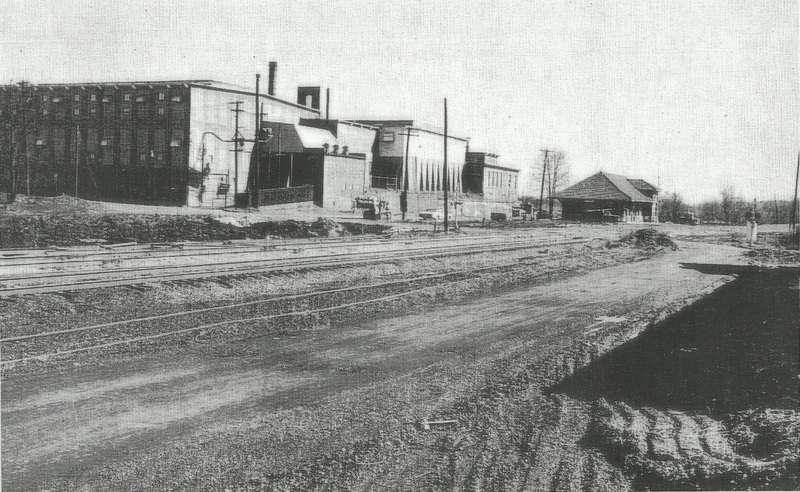 By 1902, with the railroad spur to Odell Mills complete, the plant was served directly by the Southern Railway. For almost a century, boxcars laden with raw material arrived at the mill and the finished products shipped out. Hopper cars laden with coal were a staple--as with virtually all mills--as the local trains moved on this branch into the heart of the city serving the mill needs. From a rail enthusiast perspective, this would have been a fascinating rail operation to witness. On initial thought, curiosity may pique one's thoughts as to why Concord has been less documented by the rail historian or photographer in comparison to other locations along the route. It truly does require a visit to the trackside area of old Concord to understand why this is the case. The sheer topography of the railroad layout here contrasts with other regional areas. The railroad is below the town following the low area adjacent to the Irish Buffalo Creek basin whereas the town is predominately located on the heights above avoiding the potential flood plain of the stream. Also, there was no concentration of industry along the mainline as the mills were located distant from one another. In addition, trackside access in the heart of the city is limited. There were few grade crossings and the streets that parallel the railroad are bordered by private property adjacent to the right of way. In essence, exploration of the past is restricted except for those areas at the former Corban Avenue and present day McGill Avenue grade crossings. However, it is possible to sporadically trace the industrial spur region that diverged from the mainline north of the station area that ran into the town serving various industries that terminated at Buffalo Avenue. In the great picture, though, these limitations emphasize as to why there is comparatively scant documentation of Concord----past or present---as compared to other communities that populate the former Southern Railway mainline in this region. The railroad scene in Concord today is busy but alas, it is strictly mainline run through traffic. A daily average consists of roughly thirty manifest/intermodal/ bulk commodity trains in addition to the eight passenger trains discussed earlier. There are no active shippers served directly by rail and as also mentioned previously, no passenger train stops. Included here as a perspective are several contemporary images of trains in Concord taken within the past decade. These are random glimpses from the few but best accessible locations within the original city limits. 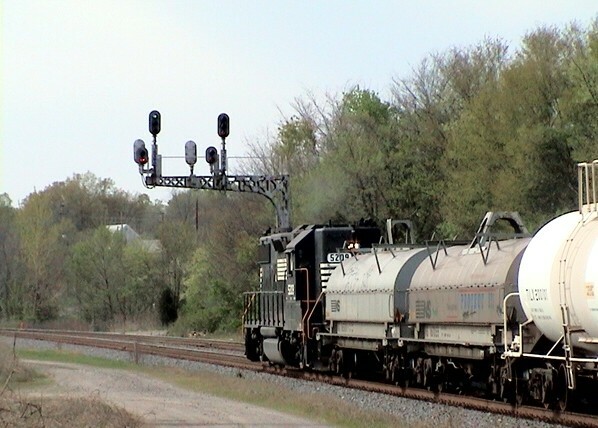 This article pertaining to the Concord passenger station was originally published on The Trackside Photographer and subsequently expanded here on WVNC Rails.